Correction (5/17/12): A photograph in Haaretz on May 16 incorrectly identified the location of clashes between Palestinians and IDF soldiers. The incident took place at the Ofer detention center, on the outskirts of Ramallah, and not as published. Whether there were violent exchanges between Palestinians and Israeli troops in Ramallah, a Palestinian Authority-controlled city (Area A), or next to the Ofer prison, which is under Israeli control (Area C), is a critical, substantive distinction. It is the difference of Israeli soldiers entering Palestinian cities versus Palestinians leaving their areas of residence to seek ought Israeli soldiers. The International Herald Tribune, owned by the New York Times and published alongside the English edition of Ha’aretz in Israel, likewise corrected a very similar photo caption error two months ago. 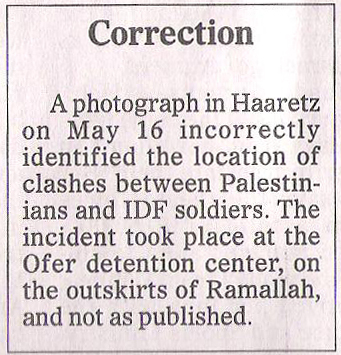 CAMERA commends Ha’aretz for the prompt correction of the photo caption.